A client commissioned work with MATRIC to define reaction conditions for a desired product in a continuous process. They had conducted an extensive batch-reaction study on this chemistry but needed to know how to operate continuously for scale-up. Among the issues needing definition/resolution were conditions to achieve full conversion, a separation/recovery process for the product and assurance that the process is operable in a continuous mode. 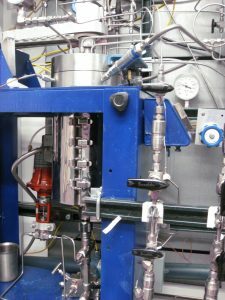 MATRIC constructed a laboratory-scale reaction system and evaluated a variety of options for operation and separations, providing the required information for scale-up.